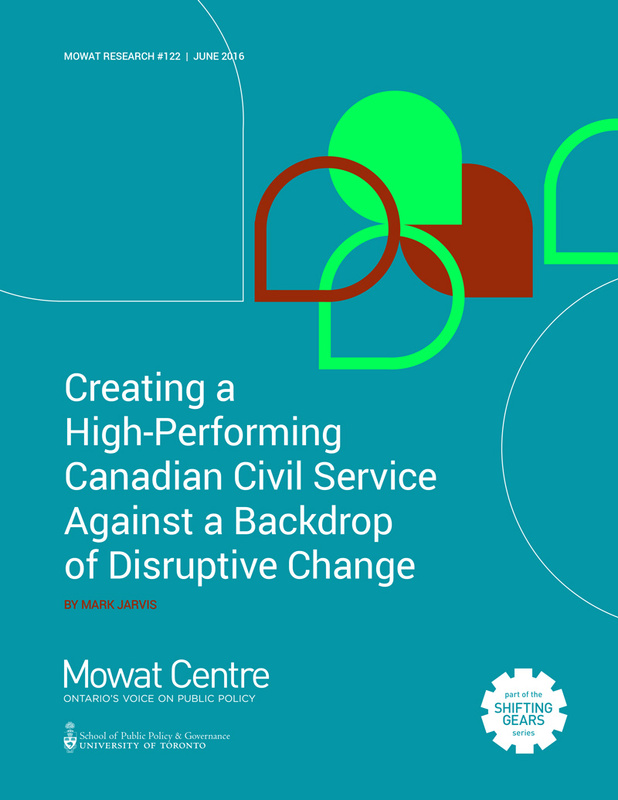 The latest from Mowat in our ongoing Shifting Gears research partnership with KPMG, this paper takes a hard look at Canada’s federal civil service. It argues that failure to sufficiently modernize has slowly eroded the civil service’s ability to meet the needs of Canadians. The paper outlines the six characteristics of a high-performing civil service and makes recommendations for transformative change. It’s time for a critical conversation about the civil service. Canada’s civil service has played an important role in building modern society, social cohesion and economic prosperity. This kind of progress depends on the continued work of a high-performing, adaptable civil service. The civil service itself is already facing new challenges. But, as disruptive as globalization, digitization, decreased trust in institutions, the polarization of politics, changing demographics and ongoing austerity have been, the world is going to change a lot more. For too long, the Canadian civil service has remained largely immune to disruption and transformation, in part because it hasn’t faced imminent threats from competitors in the same way that a private company or a not-for-profit organization might or even other levels of government have faced. This insulation has had predictable results. Past reform efforts have often fallen short of their objectives, because there were no clear consequences when reform failed. This failure to sufficiently modernize has slowly eroded the civil service’s ability to meet the needs of Canadians. If the civil service is to fulfill its role in delivering public goods and protecting the public interest, it must be more resilient, more efficient and more effective, and it must deliver outstanding results. The good news is that we know that civil servants themselves are eager to adapt and be more nimble in responding to the context in which it operates. This report focuses primarily on the federal civil service in Canada, but many of the challenges and opportunities that are discussed – and the recommendations that are made – can be equally applied to other orders of government. Civil servants at all levels of government exercise substantial authority and often have a significant impact on the lives of Canadians. The public sector economy is a substantial sector in its own right, accounting for nearly a quarter of our national employment and gross domestic product.1 Its efficiency and effectiveness are central to Canada’s economic performance. The Mowat Centre and KPMG’s Shifting Gears research series has reviewed the trends and challenges facing Canadian governments and provided strategic recommendations for navigating them. Past reports have focused on supporting an emerging civil service model that is more citizen-centred, engaged with partners, digitally-enabled and focused on results. As the next step in this work, the Mowat Centre has undertaken research and built a dialogue with experts and practitioners, in order to make recommendations for civil service reform and to articulate the next steps needed to realize that reform. The reforms proposed in this report are not ends unto themselves. Others will have their own preferred measures. The merits of all reforms can – and should – be debated in terms of how the civil service will be improved by their implementation. At a minimum, any reforms should be realistically likely to lead to positive changes to the status quo. But that alone is not sufficient. d) administering programs and operations? 2. Are the proposed reforms likely to diminish trust between the civil service and the government or the public? 3. Does each reform have a clear objective against which progress can be measured? 4. Are the proposed reforms politically feasible? These questions serve as an important touchstone for helping to ensure future civil service reforms are focused and successful.